In the recent paper by A.V. Verkhovtsev, E. Surdutovich and A.V. Solov’yov published in Scientific Reports  it is demonstrated that the phenomenon-based MultiScale Approach to the assessment of radiation damage with ions, developed by E. Surdutovich and A.V. Solov’yov, can quantitatively predict macroscopic biological outcomes in ion-beam cancer therapy through accounting for the relevant physical and chemical effects arising on the nanometer scale due to the interaction of ions with the biological medium. 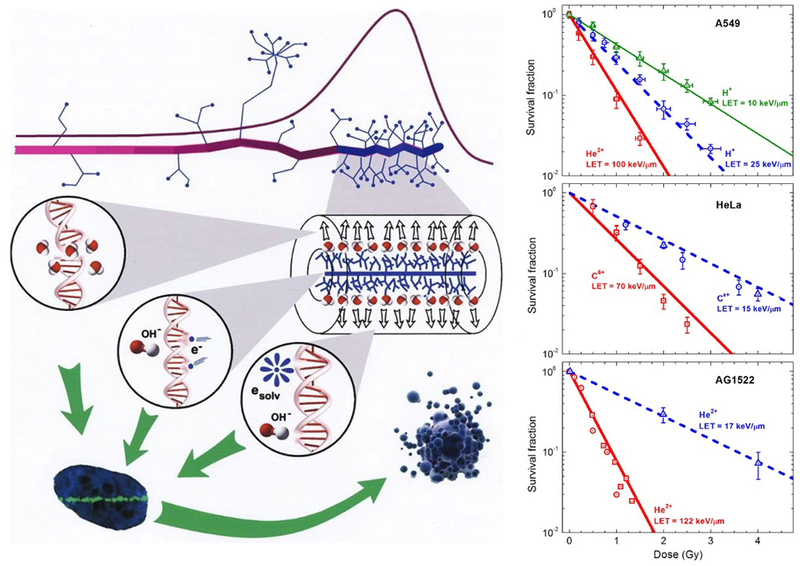 An extensive comparison with experimental data on survival probability of a broad range of mammalian cell lines, irradiated with protons and heavier ions at different values of linear energy transfer and under aerobic and hypoxic conditions, demonstrates the capability of the MultiScale Approach to accurately predict the probability of cell survival and related phenomena such as oxygen enhancement ratio. The advantages of the method allow one to extend it to many other cell lines, different cell phases, irradiation conditions and make predictive evaluation of radiobiological effects. This analysis will be continued as the understanding of the phenomena at play on a solid physical basis is crucial for technological advances of the ion-beam cancer therapy and the development of more efficient treatment protocols. Alexey Verkhovtsev, Eugene Surdutovich and Andrey V. Solov’yov, Multiscale approach predictions for biological outcomes in ion-beam cancer therapy, Scientific Reports 6, 27654 (2016), http://www.nature.com/articles/srep27654.